An easy way to make an aroma extract is to boil a small volume of wort and then steep some hops in it after you shut off the heat. You can then quickly cool your hop oil extract and add it to your beer. My specific method is to use a French press — the plunger device used to make coffee. Place some hops in a French press and pour the hot wort over them. Let the hops steep for 5 to 15 minutes, then press off the liquid. Cool this liquid and add it to your beer. In this method, oils are extracted in the hot wort, but the vapors are largely trapped in the French press. Since the oils are extracted in hot wort, the character of hop aroma it produces is similar to late kettle hopping or whirlpool hopping — it’s just that the amount of aroma is not subsequently reduced by a vigorous fermentation. The wort sugars added to the beer are quickly consumed by the yeast. If you’re adding the aroma extract at the same time you prime for bottle or keg conditioning, boil the equivalent amount of malt extract to your priming sugar and have your hop oil extract double as your primer. Compared to dry hopping, you don’t lose beer by using this method. You actually gain a small amount of volume. If you plan ahead to do this, you should take that into consideration so that any dilution is compensated for. Also, in contrast with dry hopping, this method does not make your beer hazy. For a 5.0-gallon (19-L) batch of homebrew, here’s how that might work. Let’s say you’re brewing a pale ale and you have a 1-L French press. (This is a common size.) So, you plan to add a little less than 1 L (~1 qt.) of hop oil extract to your beer in your bottling bucket. Brew your beer as you normally would, but finish with a yield of about 4.75 gallons (18 L). Essentially, your beer would be slightly stronger and more bitter, but a little less than a quart (1 L) low in volume. If your recipe called for 5.0 oz. (140 g) of priming sugar, convert this to dried malt extract by dividing by 0.75 to account for the fact that malt extract is less fermentable than straight sugar. (This is 6.6 oz. or 190 g). A small amount of sugar is going to be lost to the hops, so perhaps add 5% to your priming amount. Bring a little over 1 qt. (1 L) of water to a boil, boil it for 10 minutes (to reduce the oxygen content), then shut off the heat and stir in the malt extract. Add the hops to your French press. If you’re making a pale ale, try 0.50 oz. (14 g) of hops. For an IPA, try 1.0 oz. (28 g) and for a double IPA, try 1.5 oz. (43 g). Pour the wort into your French press with as little splashing as possible. Let the hops steep in the press for 5–15 minutes. — about the same amount of time you would let them steep in a whirlpool. Then, press off the liquid, let it cool a bit and add it to your bottling bucket. Siphon your beer into the aroma extract (which also serves as your priming sugar) and proceed with bottling as you normally would. I’ve described this method before and called it French press hopping, but that’s not a good name — you could dunk bagged hops in hot wort, then remove the bag to make the hop oil extract. 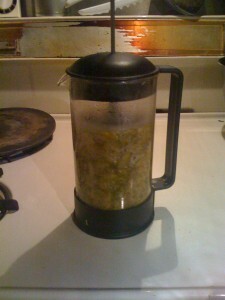 The French press is just how I separate the hop solids from the liquid. Unless I can think of a better name — aroma bombing? hop juicing? — think I’ll just call it adding aroma extract. Dry hopping and adding an aroma extract to fermented beer are two ways to boost your hop aroma. The character of these differ slightly, so they can be combined to make a beer with a very intense hop aroma, if that is desired. Is it necessary to reduce the volume of the original wort? I wouldn’t think it would have a terribly significant. If you’re only adding 1L of “hop extract” to 5 gallons of finished beer, it’s only about a 5% dilution of your abv, IBUs, FG, etc. When you add the hop extract — made of light malt extract and hops — you dilute the color and flavor of the specialty malts, as well as the hop bitterness, in the beer. So it’s better to plan ahead, especially with darker beers. The extent of the dilution isn;t great, however, and may not matter in pale beers. I’m going to have to try this on my next big hoppy batch. I have a bunch of homegrown hops frozen and I like this idea. This would be dry hopping with a contact time of a couple minutes (as opposed to the usual week to 10 days). You might get some effect, but I suspect it would be fairly small. Do you have a preference for using flowers or pellets here? I seem to have a memory of one of them really not working out too well when I tried this after you presented it on Basic Brewing way back when, but now I can’t remember if it was pellets or whole hops that gave me issues. You still advocate using wort over water (or, if bottling, water with sucrose) due to pH? Here are my thoughts on the method I’m going to follow with your french press method in mind. Bring 1 qt. of water to a boil, boil it for 5 minutes (to reduce the oxygen content). Shut off the heat and let the water cool to around 170-180F, which is the correct temperature for extracting coffee beans while keeping their essential oils and other volatiles in solution. Add .5oz-1oz. hops to my French aeropress coffee press and pour the water into the french press on top of the hops. Put the plunger part of the french aeropress slightly into the french press without pressing it down so nothing gets in and no aromas get out. Drink some homebrew and ponder my existence while the water extracts the goodies from the hops for 5-10 minutes. Press out the liquid extract into a sanitized mason jar and cap the jar of liquid extract and set it aside to cool. Empty the spent hop sludge and filter out the french press, replace with new filter. Bring another 1 qt. of water to a boil, boil it for 5 minutes (to reduce the oxygen content). Shut off the heat and cool to around 190F-210F (a higher temperature from above temperature). Put the plunger of the french press slightly into the french press without pressing it down so nothing gets in and no aromas get out. Drink some homebrew and ponder why I’m such a zymophile while the water extracts the goodies from the hops for 5-10 minutes. Cap the jars that I put the liquid extract into and let the liquid from both pressings cool down to room temp. Pour both of the liquids gathered from both pressings into my bottling bucket and gently stir in with pasteurized priming sugar solution at bottling time. Bottle up my brews and pray to Ninkasi (the ancient Sumerian goddess of beer) that it works. Hey mate, did you have any luck with your experiment!? In my previous brew, I tried dry hopping after fermentation, by adding 25g of whole dried Worcester Goldings hops in a net bag into the keg I use for resting the beer (around 2 weeks) before bottling. I noticed no increase in hop aroma in the finished beer at all…very disappointing. The beer was also very hazy..something I’ve never had a problem with before. As an experiment, I tried steeping 25g of whole dried Worcester Goldings hops in around half a pint of cold water, prodding and stirring to see if any aroma was extracted. The liquid was very bitter after only around 5 minutes of stirring and it had a very hazy, light brown appearance, the same as in my bottles of beer after dry hopping….no noticeable aroma either. Yet apparently, boiling is supposed to be required to isomerise the oils to give hop bitterness. After steeping the hops in the cold water for about 10 minutes and straining out the liquid, I also sparged the remaining hops through a strainer with boiling water. The liquid was the same…very bitter to the taste and a cloudy light brown haze…no aroma of note. Maybe the bitterness is due to tannins which can cause haze in beers. I’ve read that the boiling process reduces the tannins which are precipitated out before fermentation. Thus I am sceptical about dry hopping if it can intoduce bitter tannins and lead to hazy beer….OK in wheat beer maybe but not in English ale. I’ll try late hopping in the last 15 minutes next time….I’ve been adding all my bittering hops at the start and boiling for 1.5 hours. I grow some of my own traditional variety English brewing hops over a garden trellis. They are generally ready to pick by early September. Rather than dry hopping with dried hops or pellets into a bin or keg, I have tried picking fresh whole hops from the garden and placing one of each into the beer bottle at the bottling and priming stage. It gives a fantastic aroma and flavour to the beer, really stimulating to the palate. It’s best to squeeze the hop a few times to help release the aromas just before adding to the bottle, along with half a teaspoon of sugar and a few granules of dried brewer’s yeast for the priming. The hop could also be added to a ready primed beer too…it releases the aromas very quickly thanks to the alcohol in the beer, and holds them in the bottle. It’s a very economical and conveniently simple way of dry hopping beer but only practical for about 1 month a year. However, by pre-brewing and bottling several batches of beer in August, the hops could be added as they become available. I should add that I use swing-top bottles for all my brewing, never crown caps, so that in the case of hop additions, the bottle could be opened and reclosed easily if required. Chris…what are your thoughts using beer from the primary (after fermentation is complete) instead of wort. This would be easier. Not sure of the impact of the heat on the beer, but it is a small volume and perhaps it is minimal. Just rack off 1 L and follow your process. Much of the hop aroma I want in my IPA’s is there right before pitching my yeast. This is essentially gone after fermentation. I am presuming due to scrubbing by the CO2. Frustrating. Hoping this process would help. In fact, perhaps the ethanol in the beer would also assist (along with the heat) in extracting the hop oils. This is an interesting idea. You could try it both ways — with and without heat — to see which works better. To speculate a bit, the lower pH of the liquid and dissolved CO2 might extract a slightly different fraction of the oils. I’l d definitely have to give this a try sometime.